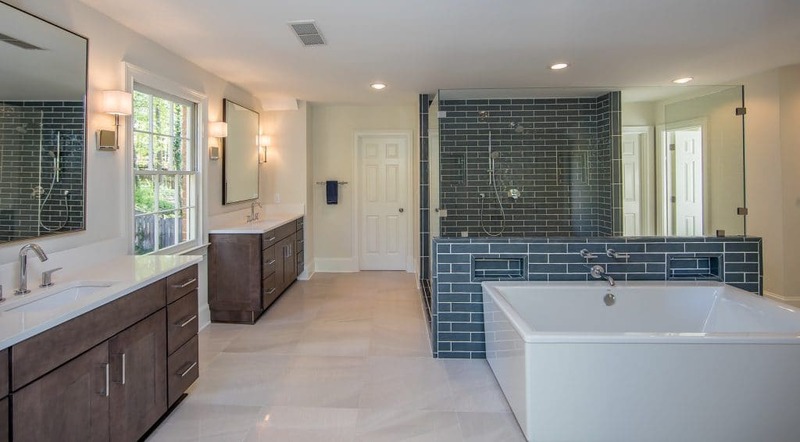 From the moment you open the doors to this master bath, you immediately feel a sense of calm and peacefulness. As designers, we want to create bathrooms to have an exceptional feel for wellness, and we believe we hit the mark. The color palette delivers a positive environment that is tasteful all year round. From the color combinations to the spa-like feel, to the spaciousness, we believe anyone would want to run a bubble bath in this space! The double shower (that includes an entrance from both sides), to the standalone bath, and double vanities make this bathroom perfect for couples or even entire families. With a simple shaker cabinet, it makes for a classic style that will stand the test of time, plus its easy maintenance! The cabinetry featured in this bath is from Masterbrand Kemper, with a Cotter door, maple wood, and chocolate stain. We love how the chocolate stain pairs with the deep blue denim color of the shower tile! 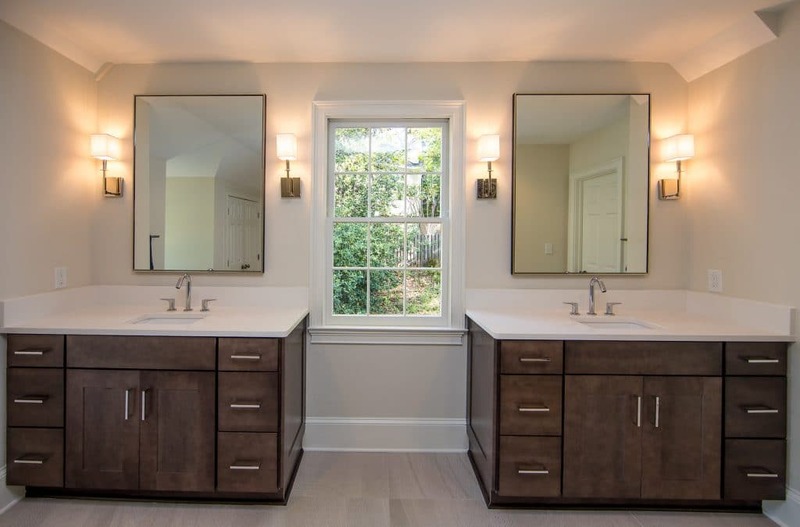 It has almost become a standard to incorporate quartz as countertop material in bathrooms. Quartz is not the only option, but it is a wonderful option when it comes to its non-porous qualities and easy maintenance. Here we have a light quartz that helps bring lightness to the overall space. 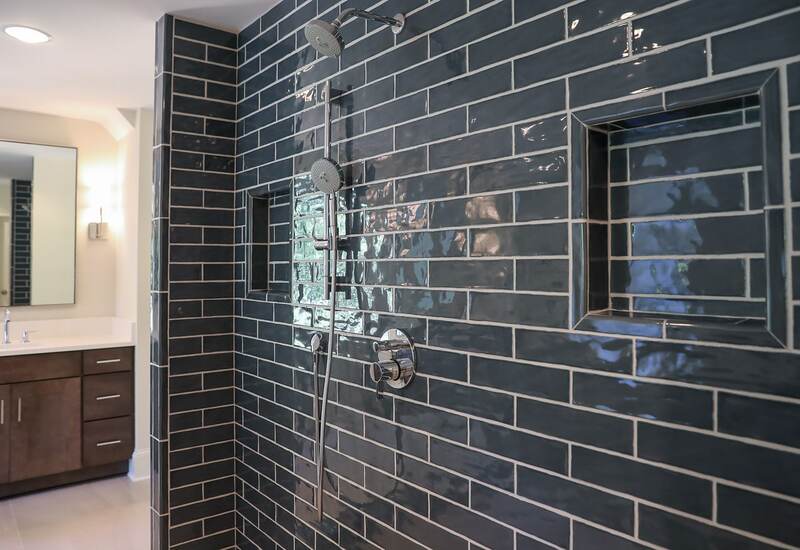 The 3×12 rustic and uneven subway shower tile, is from Artistic Tile, in B Train, in the color Indigo. 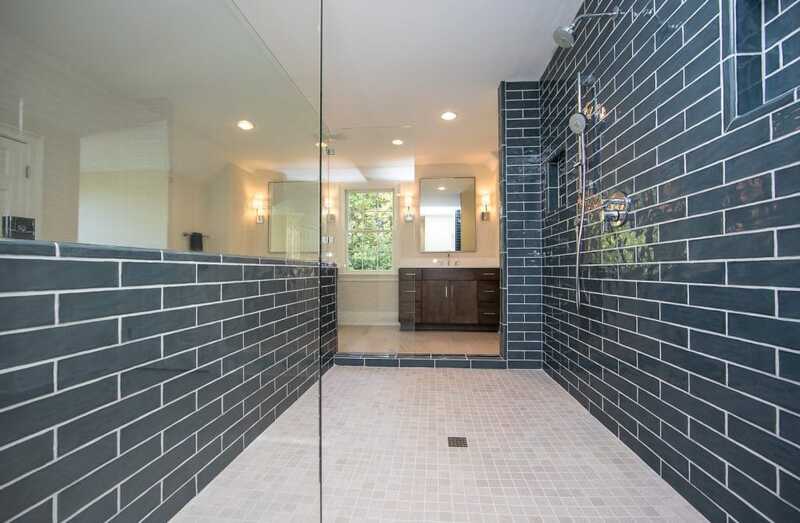 The shower floor tile is a creamy colored 1×1 mosaic providing texture and anti-slippage while in the shower. The main bathroom floor is a large format 18×18, matching the creamy color of the shower floor. Lastly, we have the bathroom fixtures. The wall-mount bath faucet is a Kohler Purist with a chrome finish. The shower fixtures and vanity fixtures are from Hansgrohe, also with a chrome finish. The fluted freestanding tub is a Kohler Stargazer tub with a white finish. Then to finish off the space, we have Murray Feiss Light fixtures with chrome detailing.